The Ross Flexiflo Companion is a 2-piece unit, consisting of a pump and a separate charger unit into which the pump can be inserted. The pump can be used as a stationary pole-mounted unit, using the pole clamp on the charger, or can function as an ambulatory pump using the optional Transporter pouch. The pump uses a dedicated cassette with a bellows mechanism to deliver measured amounts of enteral formula. 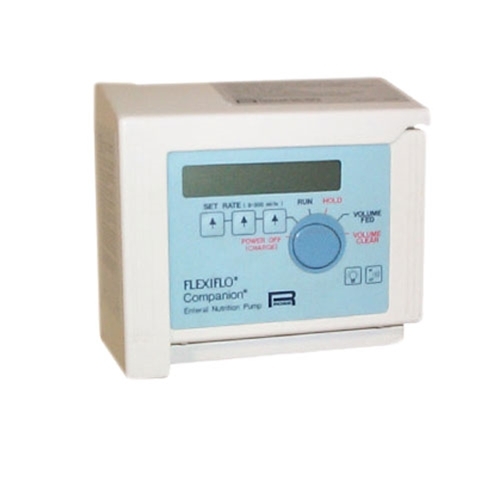 LCD display, push-button rate entry and a rotary function control. No dose limit. Ross does not recommend this product for neonatal or pediatric use.